June 22, 2018 -- Dutch researchers have created 3D-printed brain tumors based on functional MRI (fMRI) scans. Referring to these models during consultation can improve patient understanding and shared decision-making, according to an article published online on 2 June in World Neurosurgery. The group acquired patients' fMRI scans with a diffusion-tensor imaging (DTI) protocol and used these scans to make an individually tailored 3D-printed glioma and its surrounding structures for each patient. A neurosurgeon presented each patient with a 3D-printed model during consultation. 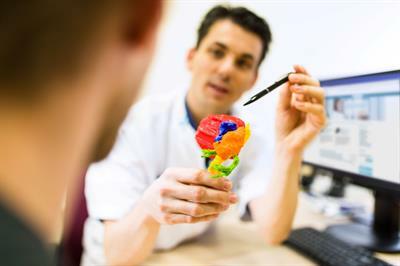 Generally, the patients saw the 3D-printed models as a valuable tool, senior author Dr. Mark ter Laan, PhD, from Radboud University Medical Center told AuntMinnieEurope.com. Their experiences were mainly positive, particularly regarding understanding their medical situation, psychological aspects, and communication. A 3D-printed glioma with surrounding structures. Image courtesy of Dr. Mark ter Laan, PhD. "We are the first to investigate what patients tend to expect from the use of 3D-printed glioma models," he said. "The facilitators, barriers, and positive and negative effects we found need to be addressed in any future quantitative evaluation of the use of 3D-printed glioma models in neurosurgery." Clinicians caring for patients with brain tumors typically examine virtual models of the patients' DTI-fMRI scans to plan tumor removal, the authors noted. In addition, they often use these virtual models to guide their explanation of the procedure and its risks during patient consultation. Patient education is particularly relevant for cases of glioma -- a type of tumor found in glial cells of the brain and spinal cord -- because there are various available choices for treatment, ranging from complete resection to biopsy with monitoring, ter Laan said. Patients' understanding of their clinical condition and treatment options is crucial for the shared decision-making process. Despite the high quality of most DTI-fMRI scans, their technical nature make it difficult for patients not well-versed in the field to fully appreciate their medical condition and treatment options by looking at the scans. As a result, clinicians at various medical institutions have started using patient-specific 3D-printed models of medical images to help reduce the communication gap between clinician and patient. Following this trend, and aiming to boost patient health literacy, ter Laan and colleagues made individually tailored 3D-printed tumor models based on the DTI-fMRI scans of 11 glioma patients admitted at their hospital between January 2015 and June 2016. The majority of the patients had grade 2 gliomas (73%). Their average age was 43, and five were female. Next, the group gave the 3D-printed models to a neurosurgeon who explained the medical condition as well as the treatment options and associated risks to all of the patients in separate meetings. The researchers conducted an interview before and after each patient consulted with the neurosurgeon. Evaluating the patients' responses, the team found the patients had a predominantly positive reaction to interacting with their personalized 3D-printed glioma. They "highly appreciated" the 3D-printed models, and most affirmed its usefulness for comprehending their medical situation and improving patient-physician communication. Several factors that the patients said contributed to these benefits were the models' lifelike scale, multicolor structure, and superior visualization over 2D images. Further analyzing the patients' responses, the investigators noted that eight patients suggested at least one perceived positive effect of examining the models and four referred to at least one negative effect. One patient claimed the 3D-printed model "helped [her] to accept the tumor as part of herself, instead of something frightening," and another said it "helped to understand the location and size of the tumor, and it provided them a clearer image than the 2D images." However, a few patients also mentioned potential barriers, namely, that seeing such a realistic 3D-printed model was emotionally confronting and "uncomfortable" in this early phase of the treatment. Overall, most patients agreed that examining a 3D-printed model of their glioma during consultation helped improve their communication with the neurosurgeon and led to a "pleasant" interaction. Several patients asked to take the model home to show to their friends and family in order to help explain their medical condition. Following this study, the researchers plan to conduct studies directly comparing the advantages of 3D-printed models with their originating 2D medical images for patient education, including a quantitative analysis of the results. The authors also recommended that future related projects seek to address the potential barriers to using 3D-printed models for patient consultation identified in this study. This may allow clinicians to evaluate the extent to which 3D printing could positively influence this aspect of healthcare, the authors concluded.